The camps on Lac Troilus are built on a point at the outlet of the lake and at the headwaters of the north branch of the Broadback River. The lake is 15 miles long, with numerous islands, bays, and smaller streams to fish. The BROADBACK RIVER starts right at the lodge. 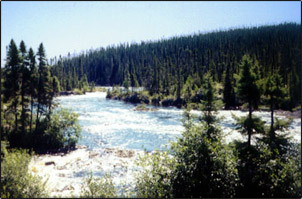 It is possible to fish several set of rapids below the camp in a day's fishing. The river varies in width from 75 to over a 100 feet, and is relatively shallow. The boulder strewn bottom makes for ideal trout habitat, with pocket water and large pools - the usual holding areas for TROPHY TROUT. This camp is recommended for the ardent fly fisherman, who prefers to fish under wading conditions for large trout. This camp is also ideal for the spin fisherman wishing to fish for a variety of species, in a truly wilderness setting. Our camp is in a wilderness area serviced by road from Chibougamau. For guests wishing to fly commercial airlines, there are daily weekday flights from Montreal to Chibougamau.